A cocktail party thrown by our hosts, Xanterra Parks and Resorts, at Mammoth Hot Springs Hotel, featured sustainable and regional fare from organic crimson lentils to organic wines and regional beers in light weight eco-friendly aluminum cans. Everything was delicious but the Baked Apple Rings with Cinnamon Pumpkin Puree really wowed me. 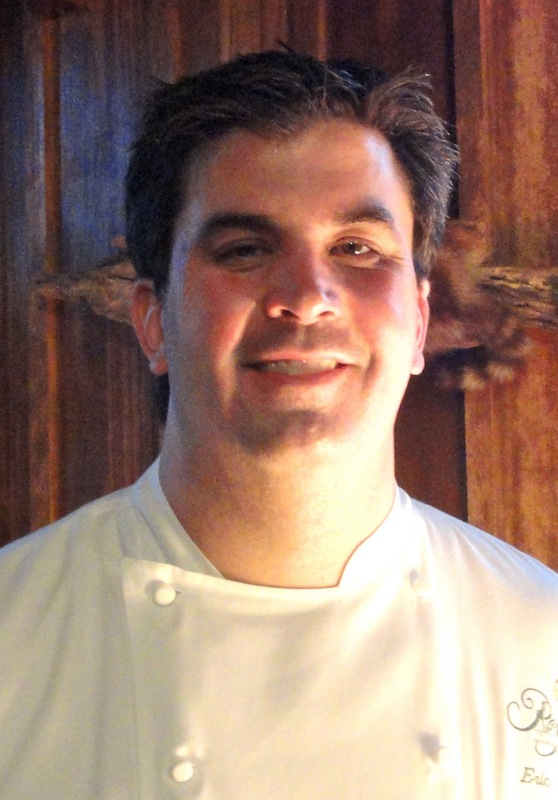 I asked Chef Joe Nobile for the recipe and he turned to its creator, Mike Dean, executive sous chef for the Yellowstone National Park Lodges. Mike admitted this was the first time he'd ever written actual recipes, apologizing for the informality of the recipes and adding "sometimes for special events we don't write recipes because they often won't be used again. 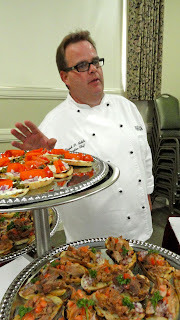 Sometimes we actually get to 'just cook' and not be constrained to recipes." This informal gathering of travel writers and park personnel fit into both categories so I'm going to relay the recipe just as Mike emailed it to me. Cut small rounds of white bread, lightly fry in melted butter over medium-high heat. When fried crispy and golden, sprinkle with a cinnamon sugar mixture. This is simple; take a can of commercially produced pumpkin pie filling and whip it with asmall amount of whipping cream, a pinch of cinnamon and some powdered sugar to the sweetness tyou desire. Simple but can be tedious (which means you probably won't find this dessert on lodge menus). Cut Granny Smith apples into rounds across the core. Use two different sized cutters. The first should be the same size as the bread rounds and remove the peel and outer section of the apple. The second should remove the seeds and core, leaving a hollow apple disc. Lightly dredge this disc with cinnamon sugar then place on a parchment paper-lined baking pan and bake in a 375-degree oven about 12 minutes or until the apple is tender and beginning to brown. Spread a little pumpkin puree on each bread round to allow the apple and bread to stick together, then pipe a dollop of the pumpkin mixture into the apple to fill it. At this point, garnish as you like, with a small dollop of whipped cream, a sprinkle of nutmeg or anything else to to make them "pretty". A Culinary Connectors' behind-the scenes-tour for two to neighborhood gems and top restaurants in Denver, Boulder or Aspen. 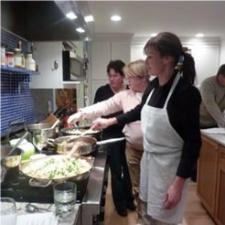 Italiaoutdoors USA private cooking class for eight at your home in northeast U.S.A.
A one-week Italian Language and Cooking class from Cactus Language in Taormina, Sicily, Italy. Give it a try. Go to www.satw.org and click on SATW 2011 Auction Live. Bidding ends Nov. 20. Reynolds Plantation is a little bit of heaven sprawled along the shores of Lake Oconee between Atlanta and Athens, GA. With six courses and the elite TaylorMade Kingdom it's known as a golf destination but also offers fishing, tennis, a Ritz-Carlton spa and some remarkable cuisine. I was fortunate enough to be a guest there when Chef de Cuisine Eric Fulkerson was showcasing his staff's abilities. 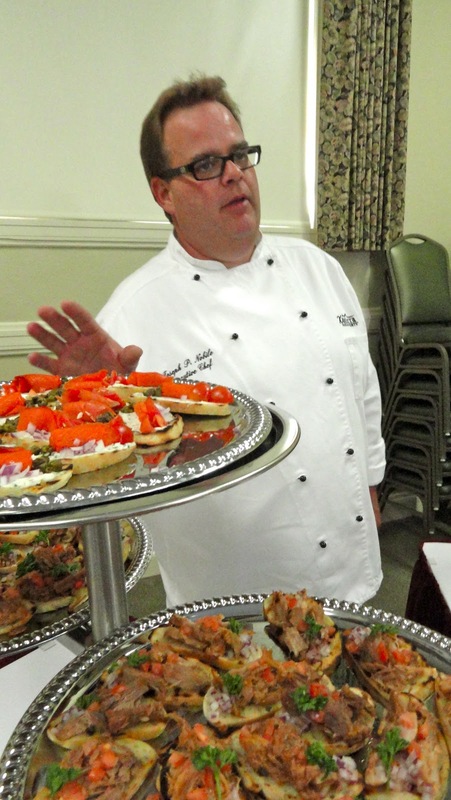 During a reception at the resort's Heritage and Nature Center, they passed country fried breasts of quail with golden tomato and bacon jam that disappeared as quickly as they emerged from the kitchen. Try it yourself and you'll soon see why. Make sure quail breasts are split and cartilage removed; trim any fat but do not remove the skin. In a small bowl mix the flour, salt and pepper with the ranch seasoning. Mix 1/2 cup of this with the corn meal in another bowl. Add oil to a frying pan and place on medium heat; allow to heat for about 2 minutes without smoking. Coat the quail with flour, shaking off the excess. Dip in the egg then into the corn meal mix, again shaking off the excess. Gently place coated breasts into the hot oil. Cook for one minute, turn and cook for another minute. Remove and drain on paper towels. Arrange cooked breasts on a plate topping each with a teaspoon of Tomato and Bacon Jam. In a large skillet over medium heat cook the bacon until almost rendered, not too crispy, about 7 minutes. Transfer bacon to paper towels and drain excess fat. In a large saucepan, combine the tomatoes, onion, sugar, cider vinegar, salt and pepper. Bring to a boil, stirring often, then reduce heat to medium, Crumble the bacon into the tomato mixure. Simmer until very thick, about 1 hour. Season with salt and pepper as needed. Let the jam cool then ladle into jars. Can be refrigerated for 3 to 4 days or frozen for up to 2 months. If freezing, divide the jam among several small jars. When ready to use, let a jar thaw overnight in the refrigerator. 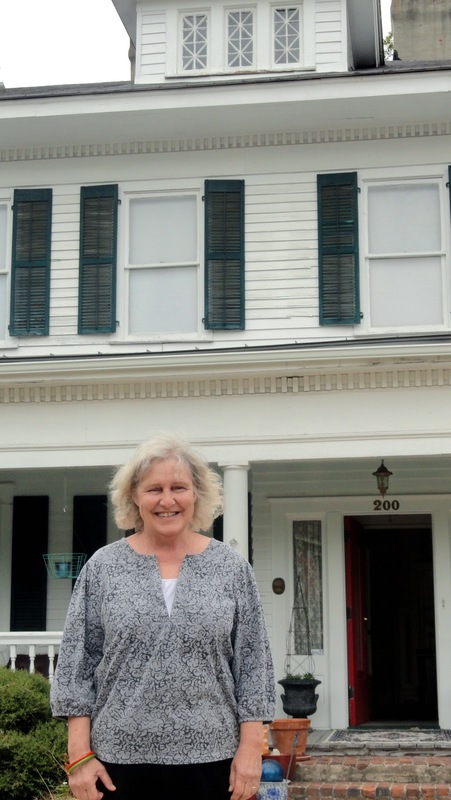 Karen Berni, proprietor of historic Bernibrooks Inn in Abbeville, S. C., is a collector. In addition to antique furniture, china, pottery and mid-century modern decorative ceramics, recipes are among her favorites. Morning two of my stay at Bernibrooks I was still full from the Campground Cookoff judging (more about that in later posts), but when Karen brought out the puffy oven-baked pancake, there was no way I was going to miss it. You won't want to either. Beat eggs at medium speed with electric blender until blended. Gradually add flour, beating until smooth. Add milk, 2 TBS. melted margarine and salt. Beat until smooth. Pour mixture into a greased 10" baking dish or cast iron skillet. Bake at 400 degrees for 15 minutes or until pancake is puffed and golden brown. Sprinkle with the sugar and almonds. Combine the remaining 2 TBS. margarine and lemon juice, heating until margarine melts. Serve over the hot pancake. Best served straight from the oven while it holds that "souffle" look. Labels: Bernibrooks Inn Oven Baked Pancake recipe. Abbeville, S.C.
Karen Berni in front of her antebellum National Register-listed home and inn. Southerners believe in a good breakfast and Karen Berni, proprietor of Bernibrooks Inn in Abbeville, S.C., is no exception. Eating was the last thing I had in mind when I came down that first morning. In a matter of hours I would be judging the entrees and desserts prepared by 28 teams entered in the South Carolina Campground Cookoff. "I don't know how to cook just a little," said Karen. Nor was I able to eat just a little of her delectable dishes. Here's the first, a great way to sneak in a healthy start on the day for your kids. Combine liquids with oat mixture. Pour into a sprayed 8" square pan or 10" quiche pan. Bake at 325 degrees until liquid is absorbed and top is light golden, about 45 minutes. Serve warm with cream fruit sauce, maple or caramel syrup. Labels: Abbeville, baked oatmeal recipe, Bernibrooks Inn, healthy breakfast, S.C.